House additions are one of our specialties at Inspire Homes, but we do more than merely raise roofs and expand foundations. With each project, our goal is to uncover problem areas or ineffective spaces in our clients’ homes and find ways to enhance the longevity, functionality and overall aesthetic. 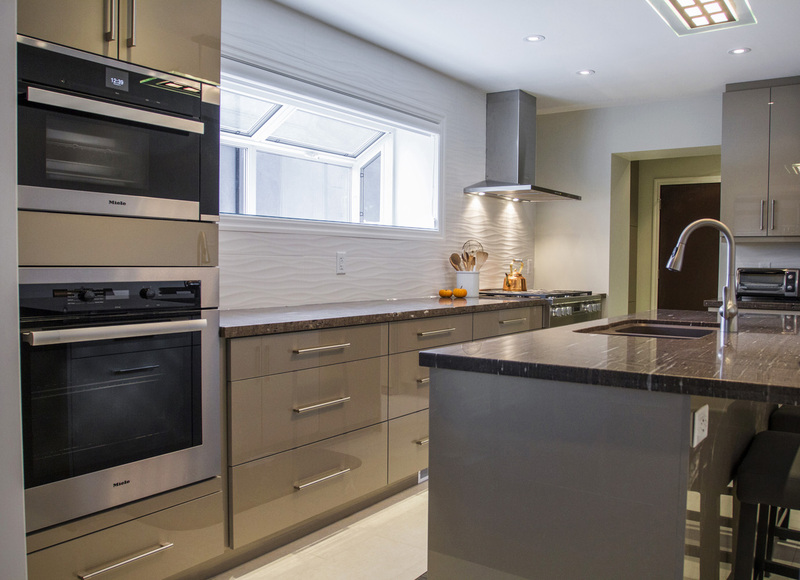 A recent Don Mills project in North York is a great example. Originally built in the 1960s, this family home was showings its age – most of the finishes were original, including some of the bathrooms, and the rooms were small and dark. The house’s overall energy efficiency was lacking too with little insulation in the walls. 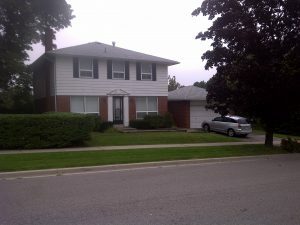 Original 1960s North York house before renovation. With plans to call this their forever home, our clients desired a solution that would ensure the durability and functionality of the house for now and into the future. Aging in place is becoming more popular with Canadians and we’re especially noticing this trend with the families we work with. The homeowners also wanted to bridge an existing gap between the house and separate garage and re-think the floor area for better usability and flow. Rather than demolish a perfectly good structure, our solution was to build a 500 sq. ft. two-storey addition between the house and garage. Fusing these two elements together provides better functionality for the family, plus it allowed us to expand the floor space inside the home. All of the interior walls and finishes were removed and the staircase was relocated to a new area, thus opening up the first and second storeys to accommodate a more useful layout. Spray foam now insulates the walls on all three levels for better efficiency and comfort year-round. New windows and doors were also included in the project scope with a low-maintenance steel roof and a combination of stone and stucco on the exterior facade. Stone and stucco facade, steel roof and energy efficient windows. At the heart of the main floor is a new larger kitchen with contemporary finishes and a high-end design. Cabinets line the walls offering incredible storage, while the centre of the kitchen is anchored by a spacious island with a sink, granite counters and seating. The kitchen’s tile floors carry into the adjacent pantry with a wet bar, plus we were able to add a mudroom with garage entry and custom cabinets, main floor laundry and a powder room – all of which previously did not exist. With the staircase relocated, the main floor also opened up to accommodate a larger living room and dining room. Contemporary kitchen in North York house addition. Certain design elements were incorporated into the renovation to fulfil the homeowners’ desires to age in place, including the staircase, which is wider with a lower stair tread rise to make them easier to climb. Door openings within the home were also widened to accommodate better maneuverability, while lever handles make it easier to open doors for those with arthritis or grip issues. The glass railings on the staircase and landing add a contemporary look to the home, but are purposeful by keeping the staircase bright and open feeling. 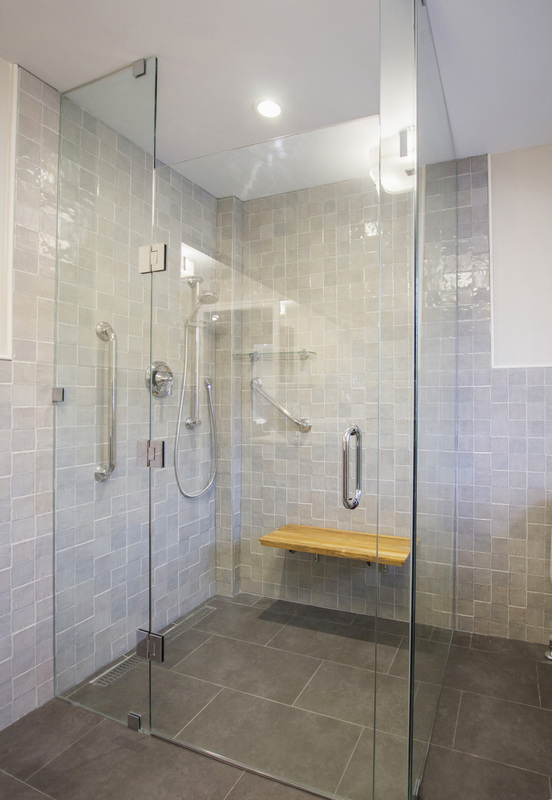 Upstairs, a new floor plan boasts four bedrooms and two bathrooms – one of which was remodelled with a glass shower and curbless entry for a universal design. Towel warmers add a touch of luxury to the spaces, along with modern vanities, quartz countertops and built-in storage. We could go on and on about this 2,700 sq. ft. whole home renovation and addition – it certainly stands out as one of our favourites. 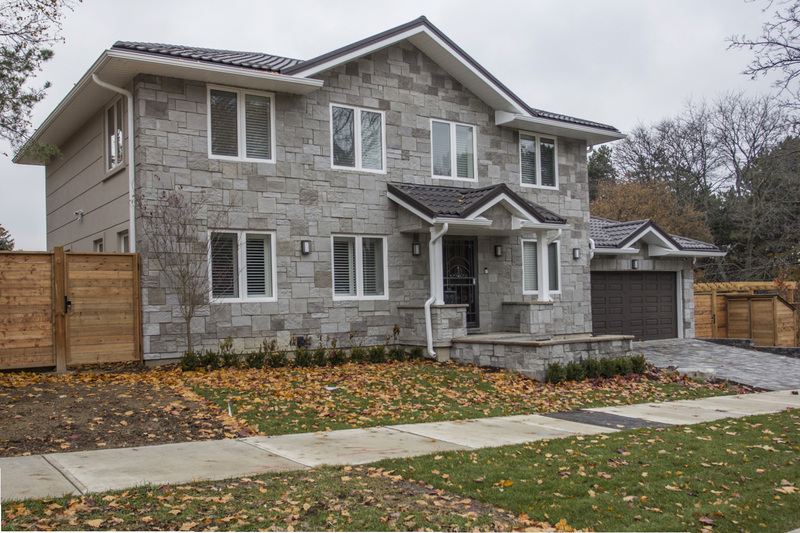 To see more before and afters, hop on over to our Home Addition Project Gallery on our website, where we share this North York property, as well as other completed projects across the GTA.